Classic Glass offers backpainted glass in virtually limitless spectrums of color, and can match most colors found in the Pantone Color guide. Backpainted glass is available on either plate or low-iron glass. Custom shapes and edgework are available. Back painted glass is ideal for use in architectural elements such as walls, countertops, and backsplashes. When opacity and an easily cleaned surface are required, yet a specific color is preferred, backpainted glass is an excellent choice. 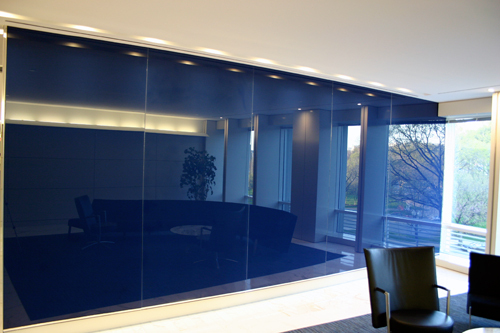 Backpainted glass is simply glass that is painted on the back and then sealed or backed with a protective mask. Classic Glass offers backpainted glass in virtually limitless spectrums of color. We can also match most colors found in the Pantone Color guide. Backpainted glass is available on either plate or low-iron glass and can be tempered to meet safety standards. Custom shapes and edgework are also available. Backpainted glass is ideal for use in architectural elements such as walls, countertops, and backsplashes. When opacity and an easily cleaned surface are required, yet a specific color is preferred, backpainted glass is an excellent choice. Classic Glass offers custom back painted glass in virtually limitless spectrums of color, we can also match most colors found in the Pantone Color guide. Custom shapes, cut-outs and edge-work are available on either plate, low-iron or starphire glass. Back painted glass is ideal for use in architectural elements such as walls, countertops and backsplashes. When opacity and an easily cleaned surface are required, yet a specific color is preferred, backpainted glass provides an excellent choice. In addition to producing custom backpainted glass, Classic Glass, Inc. is also a licensed supplier of Dreamwalls Color Glass products. Dreamwalls Color Glass is manufactured using a proprietary paint technology developed specifically for superior adhesion to glass. The result is a sleek functional glass product utilizing Starphire Ultra-Clear Glass to ensure the purest transmission of color. Dreamwalls glass is available in several stock colors and sizes, other options are available upon request. Extensive testing on Dreamwalls glass verifies it durability and resistance to color fading by UV light, chemicals, cleaners and moisture. 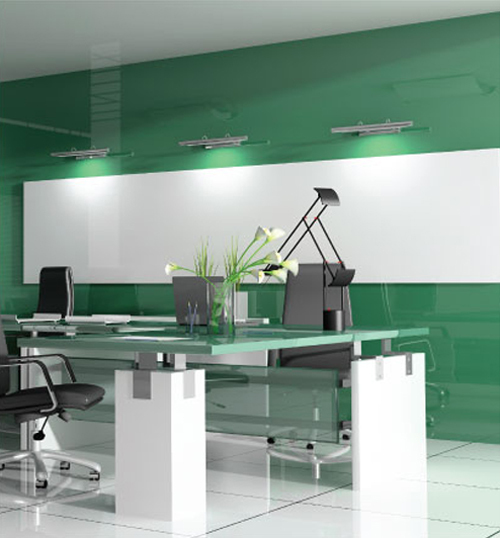 Please contact Classic Glass regarding Dreamwalls Color Glass products. This entry was posted on Friday, July 31st, 2009 at 9:19 am	and is filed under Decorative Glass. You can follow any responses to this entry through the RSS 2.0 feed.Both comments and pings are currently closed.